Fort Gordon is home to the United States Army Signal Corps and Signal Center. The installation is located in Richmond, Jefferson, McDuffie and Columbia counties, Georgia. The main component of the post is the Advanced Individual Training for Signal Corps military occupational specialties. The U.S. Army Signal Center and Fort Gordon,"The Home of the Signal Corps," train more soldiers than any other branch training center of the United States Army. Camp Gordon was named after the Confederate Lieutenant General John Brown Gordon. During World War II, the installation was activated for infantry and armor training. In September 1948, the Signal Corps Training Center was established here. Camp Gordon was re-designated Fort Gordon and become a permanent Army installation in 1956. Designating the installation of the U.S. Army Signal Center, the Army consolidated all communications training at Fort Gordon in 1974. Fort Gordon figures prominently in the post-Cold-War national defense. 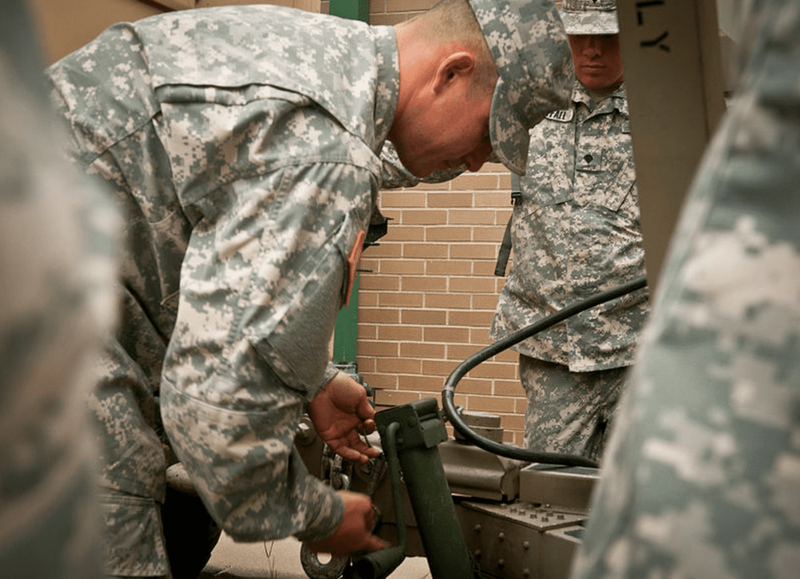 Fort Gordon's primary mission is training for signal and ordinance soldiers. Fort Gordon is located just a few miles southwest of Augusta, Georgia, and coves 56,000 acres of land. If arriving at Fort Gordon by Augusta Regional Airport, commonly called Bush Field, you'll exit from the airport's main entrance and take Tobacco Road. Tobacco Road will lead you directly into the post via Gate 5. After entering the gate, follow Avenue of the States, which will become Rice Road. At the intersection with Chamberlain Avenue, Darling Hall (the soldier service center) will be on the right. It's a three-story brick building with a red roof. If you need ground transportation to the post, exit the airport terminal and you should find a taxi stand. Radio Cab has the contract to provide a taxi service on to the installation. Cab fares from the airport to the post should be $15.00 for up to two passengers and $3.00 for each additional passenger. Make sure that the cab is a Radio Cab that has "Post Service" written on both front doors and is marked with a two-digit number. Other cabs may deliver you to Fort Gordon, but the cost may be substantially higher. There is no shuttle transportation to the post. You may call the 15th Signal Brigade staff duty at 706-791-8314 and request to have the driver pick you up at the airport. Take Exit 194 to Belair Road and Dyess Parkway. Follow the Dyess Parkway signs, and also the Fort Gordon signs. Dyess Parkway will bring you directly into the post through Gate 1. Follow the road, which is Chamberlain Avenue, past the guard house. On the left, you will see Darling Hall, a three-story brick building with a red roof. Darling Hall is the Soldier Service Center and, most likely, your first stop at Fort Gordon. 15th Regimental Signal Brigade, home to the 73d Ordnance (TRADOC), 369th Signal (TRADOC), 447th Signal (TRADOC) and 551st Signal Battalions. Fort Gordon has 736 transient quarters available for government travelers. The majority of these quarters are single rooms designed for and primarily supporting the TDY student population. There are a limited number of quarters suitable for PCS families with more than two children, although multiple room reservations can be made when available. Lodging has limited designated pet rooms. You should indicate your pet requirement when making reservations so reservationists can inform you of availability and additional associated costs. A list of local hotels and motels is available on the Army Community Services website. The list identifies those that accept pets. Priority of assignment is provided to TDY students due to the new Military Training Service Support (MTSS) Program initiative, PCS, and other transient guests. MTSS students do not make advanced reservations because they are booked via ATRRs. All others may call for reservations at 706-790-3676 ext 1007 or 1008. Fort Gordon currently has approximately 900 family housing units. All family housing is privatized and operated by Balfour Beatty Communities, and over 300 new homes have been built since May 2007. Many have garages (in some cases, two-car garages) and fenced backyards. The number of units available at any given time varies due to new construction and renovation work. Wait times vary depending on rank and construction; as of April 2008, many arriving personnel are offered quarters immediately and others within one month. Residents living in Fort Gordon housing will release their BAH to GMH Military Housing. If both husband and wife in one home/dwelling are active-duty residents, only the senior member or the member drawing BAH with a dependent rate -- whichever is higher -- will release the BAH to the landlord. Barracks housing for single service members is controlled by each unit. Renovations are underway for some barracks buildings. There is a wide variety of room configurations depending on rank and unit. Augusta has many apartments ​within a few miles of Fort Gordon. Rent is reasonable and below national averages. Typically, vacancies will be common due to high turnover among military residents. There are few, if any, furnished apartments available, and furnished corporate apartments can be found, but rents start at about $1300 per month. Overall, the cost of living in the Augusta area is 8.2% below the national average and housing costs are 24% below the national average. Also, utility costs run 8.1% below the national average. The Augusta area has more homes in the mid-price range than the national average, and the inventory of relatively new housing (built since 1980) is higher than the national average. Children of personnel assigned to Fort Gordon typically attend public schools in either Richmond or Columbia County. High school students living on the installation attend Richmond Academy High School. Transportation is provided by Richmond County. Elementary and middle school students living on the installation attend Freedom Park Elementary School, a Richmond County school located on the installation. If your child is entering kindergarten, you will need a certified copy of your child's birth certificate, a Georgia Certificate of Immunization (Ga Form 3032) and a Georgia Certificate of Eye, Ear and Dental Examination (Ga Form 3300). If your child is entering school from another state, you will need the two Georgia forms and a copy of your child's last report card. Special education is available at all schools. Parents of children with special needs can facilitate the transition from their child's previous school to enrollment in Richmond County Schools by insuring that they have a copy of their child's current Individual Educational Plan (IEP). Typically, high school extracurricular programs include school publications, academic clubs, student government, fine arts, ROTC, color guard (usually associated with marching band) and cheerleading. Davidson is a fine arts magnet school and has some of the highest SAT scores in the state. Entrance is by audition only. Many military-dependent children attend schools in neighboring Columbia County. Bus service is available at no cost. For information on home schooling call the Director of Student Services at 706-541-0650. Brenau University, Paine College, Southern Illinois University, Georgia Military College, Troy University and Central Michigan University offer degree programs on Fort Gordon. All children must be registered to use any Child and Youth Services program. The Central Registration Office is open weekdays from 0800-1630 and is located in Building 40200, in the Brems Barracks area behind the main post exchange. Documents needed to register for CYS are: Current Immunization Record, Birth Certificate, Social Security Card, Leave and Earning Statement (for both parents) and three local emergency contacts. Guardians should bring their legal Power of Attorney. Parents have 30 days to provide Central Registration with a Family Care Plan and documentation of a recent medical physical for each child. Call 706-791-4455/4722 for an appointment. The Fort Gordon Child Development Center offers full-day developmental programs for infants, pre-toddlers, toddlers and preschool children ages 6 weeks to 5 years of age. The fullday program is open weekdays from 0515 to 1800. The program also offers hourly care services to parents who need care on an intermittent basis for children ages 6 weeks to 12 years of age. Child care is provided in the hourly program by reservation only, on weekdays from 0800-1700. The Child Development Center Annex, Building 45400, houses the pre-kindergarten program. The pre-kindergarten program is offered during the regular school year and follows the Richmond County School calendar. Because it is part of the Georgia Pre-K program, there is no charge for this service. Call 706-791-4455. The administrative offices for the Family Child Care Program are located in Building 45400. FCC providers receive the same competency-base training as the Child Development Center (CDC) program assistances. All homes undergo periodic inspections. The Fort Gordon School Age Services (SAS) Program is designed to service children 5-10 years of age. For more information, call 706-791-6500. The Dwight D. Eisenhower Army Medical Center, two Veterans Administration hospitals, and several other local hospitals provide medical care to Fort Gordon personnel and their family members. The Dwight D. Eisenhower Army Medical Center (DDEAMC) offers a wide variety of medical specialties and clinics. Patients needing any specialty not found at EAMC will most likely be referred to one of the many local hospitals. DDEAMC is a 300-bed hospital and serves as the headquarters of the Army's Southeast Regional Medical Command. SERMC oversees the Army's hospitals and clinics within the southeastern United States and Puerto Rico. The Health and Wellness Center, located in Building 29605 next to Gym 4, is the central resource for health education classes, health risk assessments, fitness assessments, health information, community health awareness, individual and group counseling, preventive health screenings, and fitness programs. The U.S. Army Dental Activity, Fort Gordon provides comprehensive dental care at three dental clinic locations. Snyder Dental Clinic treats active duty military for sick call or annual examinations. Personnel should report for sick call during the hours of 0730 and 0930. Tingay Dental Clinic, located in Building 320, provides specialty care by referral in periodontics, endodontics, and prosthodontics. The Hospital Dental Clinic, on the first floor of the Eisenhower Army Medical Center, provides oral and maxillofacial surgery by referral. Military personnel assigned to the Eisenhower Army Medical Center, U.S. Army Dental Activity and U.S. Army Dental Laboratory receive their dental care at this location.